1. Start by drawing three oval shapes, one large one and 2 smaller ones on the left and right side of the large oval. Add also thin guidelines such as a vertical line and two horizontal lines to serve as a guide in drawing the eyes and mouth of the model. 2. Then using the first guideline draw now the eyes. In drawing the eyes draw a pointy oblong shape with four circles in it, add also some wavy eyelashes since for this picture the model used is a young woman. 4. 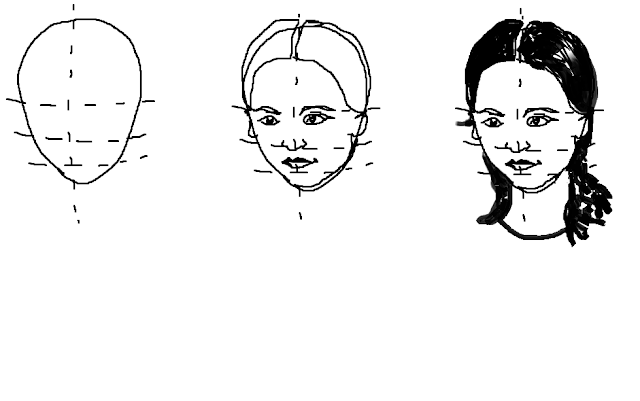 Now draw the lips on the second horizontal guideline.Finally draw her hair and a squiggly line on her left ear and then you’re done drawing her. 5. Outline your drawing with a black pen or marker and then apply an amount of shading on your drawing using a charcoal pencil or a regular pencil. And then apply a minimal amount of colour by colouring her lips and eyes.